Roasted barley tea, which is popular in the Far East, is usually called barley coffee when it’s served in the United States. Chicory is often paired with ground coffee, and when it’s combined with roasted barley, the resulting beverage gains a depth of flavor and color. Barley and chicory each contain natural antioxidants. While there’s only preliminary research into the roles of these antioxidants, they might have benefits as diverse as preventing cavities to potentially fighting cancer. Roasted barley and chicory are both enjoyed as caffeine-free coffee substitutes. Blends containing chicory and coffee are favorites in some areas, such as New Orleans. Both ingredients are sometimes added to ground coffee as fillers, where they add to the coffee’s bulk during times when problems such as drought affect the amount of coffee harvested. The chicory used in coffee comes from the root of the common chicory plant, which is roasted and ground. To make tea from roasted barley, the whole grains must be simmered in water for about 20 minutes. Barley tea contains a variety of plant-based compounds called flavonoids, including quercetin, reported an article published in Bioscience, Biotechnology and Biochemistry in 2004. These compounds act as antioxidants. In laboratory tests, antioxidants from barley inhibited the growth of cancer cells by blocking damage to DNA from reactive molecules called free radicals, according to a report published in the January 2009 issue of Phytomedicine. However, more studies must be conducted to determine whether antioxidants in barley tea fight cancer in people. Drinking barley tea with chicory may keep your teeth healthy because both ingredients help prevent cavities. Barley tea contains compounds called melanoidins, while chicory contributes quinic acid. These substances help inhibit the growth of cavity-causing bacteria. Roasted barley tea, or coffee, stopped bacteria from sticking to tooth enamel in lab tests, according to a report in the Journal of Agricultural and Food Chemistry in December 2006. The report also noted that the active substance, melanoidin, likely develops when barley is roasted. However, it’s not yet known exactly how much roasted barley tea reduces the incidence of cavities in people. The compounds responsible for chicory’s bitter taste may add to the benefits from drinking barley tea with chicory. These active ingredients, called sesquiterpene lactones, are easily extracted from chicory roots. In fact, tea made with chicory root is a source of sesquiterpenes. 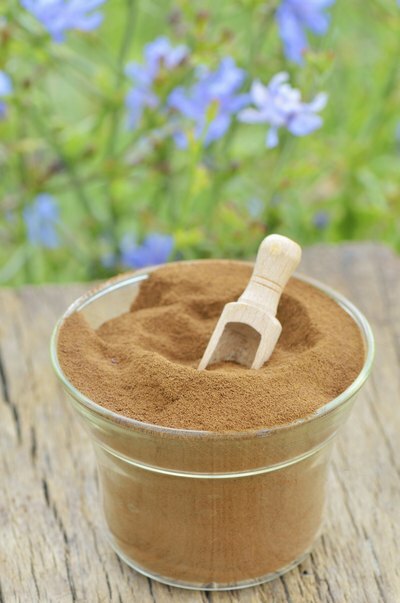 Chicory root extract containing sesquiterpene lactones reduced inflammation caused by colon cancer cells, which may help prevent the growth of new cancer cells, according to studies cited in the International Journal of Molecular Sciences in June 2013. Since studies so far have been in the lab, research using people is needed to verify whether they have the same effect in the human body.